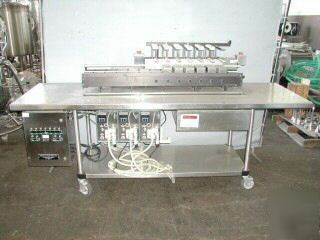 Oyster Bay Pump Company liquid dispensing system filler, model PT-Q2-10-1, serial number 0060226. Unit was last used on liquids, unit has seven heads each with 5 nozzles that were last filling test tubes. Filler has a small vacuum pump with it and accumulation table. Excellent condition.